***Some of the most serious local restaurant openings in a while: one to watch closely is Le Diplomate of Chef Aaron Langille, expected to be opened in Oct, according to what’s been leaked out from the local medias. I had the opportunity to sample his food when he was working at Café Sardine, and yep, he is easily one of the most talented contemporary globe-trotting cooking’s local Chefs. With his subsequent short period at the helm of Orange Rouge, there was no doubt that the Chef was at ease with ingredients and techniques (for eg, he was very comfortable with Modern Nordic ) from all over the world. Very creative Chef with a contemporary free spirited approach of cooking but with a solid mastery of classic technique, which is why his food does not taste like some dull assembling of ingredients. 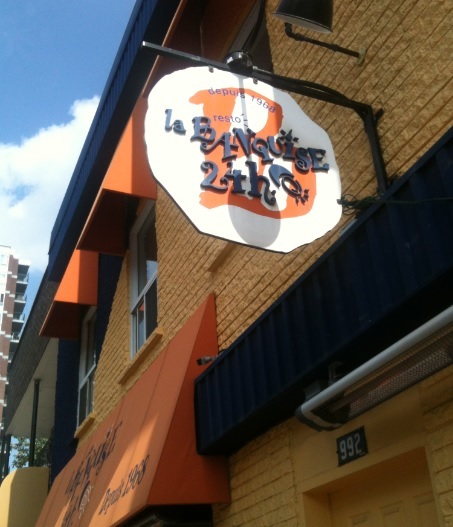 The other widely expected opening is the one of Charles-Antoine Crête, a Chef who needs no introduction in Montreal. His years at Toqué is a reminder of his solid classic background. Expect tasty food from one of the better Chefs of Quebec, of whom I know just one flaw: at times, when he tries too much to be creative and new school (meaning less classic), he loses a bit of his ‘splendeur’. But there’s no denying it: a very talented Chef, indeed! His restaurant (Montréal Plaza, 6230, Saint-Hubert, Montréal 514 903-6230) is now opened as/per this article of nightlife.ca. One Chef who’s very capable of leading the pack of the currently skilled local Chefs is Mehdi Brunet-Benkritly. Chef Brunet-Benkritly went abroad, impressing the local New York food scene with his creations at restaurant Fedora. Certainly one of the few local Chefs who can, granted that’s his intent, turn Montreal into a true foodie destination. Time will tell, but at least here’s a Chef who can ‘jump as high’ as he is willing to. The ball is in Chef Brunet-Benkritly’s court! For now, little is known about his next project. There’s also Chef Antonin Mousseau-Rivard (whose restaurant, le Mousso, 1023 Ontario Est, 438-384-7410 is opening this month) who has teased us, online, for a while now, with eye candy pictures of some of his (future??) creations — see here. 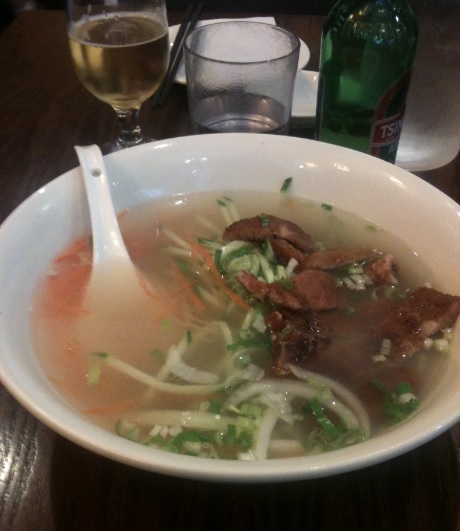 The dishes look really nice, by our local standards, indeed. I have never tried his food but I do mention his name since he seems to be a social media super-star among local foodies, therefore his name and projects eventually caught my attention. Looking forward to discover this Chef, who seem, based on online reports, to be inspired by a mezcla of International influences (the foliage trend of the novel nordic cuisine, etc). Last but not least, chef John Winter Russell who used to work at (the now closed) restaurant Van Horne. His upcoming restaurant is called Candide. I haven’t tried his food yet, so another local star Chef that I am looking forward to discover. Bottom line, I am expecting no culinary revolution, rather some trends and themes ‘used and abused’ abroad, though certainly some of the most interesting additions to the local restaurant scene since a long time. ***Oh dumplings! I was looking for some decent dumplings lately. 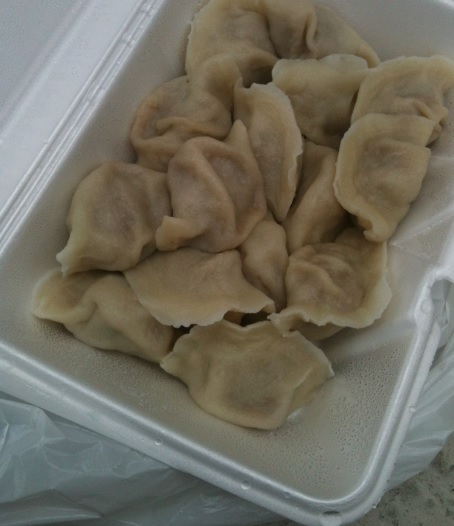 A local foodie whose taste I trust did recommend Oh dumplings! in Chinatown. PROS: Fun, lively place. I wish all eateries had such ambience. 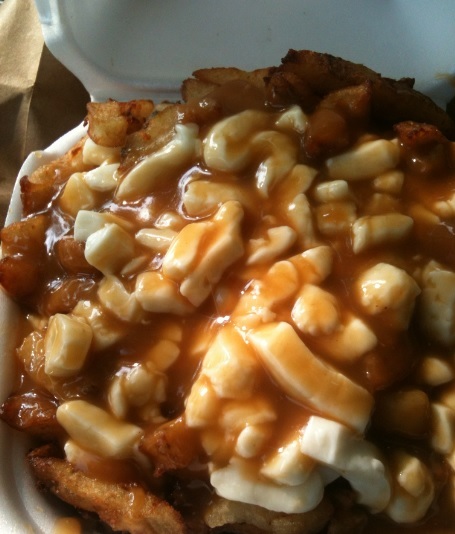 CONS: The finest classic poutines in Quebec feature large chunky pieces of french fries full of lingering potato flavor. In contrast, in this instance, the french fries were half the size of your standard poutine french fries, the potato flavor unexpressed. Cheese curds were of the tiny type, therefore you need a mouthful of those cheese curds to fully enjoy the texture and the taste of the cheese (a sensation that big chunky pieces of fresh cheese curds will deliver way better than). The better poutine spots of this province will never fail to serve you the standard big chunks of cheese curds. Even in the local depanneurs, your cheese curds is of the normal chunky type. The sauce is one fine version of the poutine sauce, but there was not enough sauce for the quantity of french fries offered. *** Joe Beef – JB is all the rage these days, here and abroad, ever since it was listed in San Pellegrino’s World’s top 100 best restaurants, and I am glad for them as I have always been a huge fan of Chefs David Macmillan’s honest verbiage as well as Fred Morin’s sort of humble personality. It was never going to be perfect in their world, however, as exemplified by their aversion to food bloggers – Dixit David McMillan ’’The foodies in control and the foodies that are blogging like crazy and putting these OCD chefs and pretentious restaurants on pedestals are very similar to what you see in Trekkies’’ (Source: Joe Beef’s McMillan & Morin on Montreal Cooking, OCD Chefs, and the Future; by Talia Baiocchi May 21, 2012, here for that article). David McMillan may be condemning the influence of food bloggers and other sources of social media visibility on the restaurant world, but he goes to great lengths to show just what kind of attention such exposure can buy: allowing Anthony Bourdain to make a TV show on Joe Beef, publishing books, etc. One wonders how JB managed to be successful enough to launch a mini restaurant empire (Vin Papillon, Liverpool House) without the publicity that David seems to decry.. But they built a cult around them, which few managed to do, and it works. Furthermore, as Montrealers, we know well how hard they have worked to get there. The rage is so strong that a foodie acquaintance from NYC (whom I met through my food blog) had learned about the worldwide fame of JB and has booked JB for July and did invite me to eat there with him. On the evening I was there, it was clear that foodies have invaded the place: plenty of ppl taking pics, etc. I mean, late in the evening, with barely no light, please ppl…. I do not mind taking pics in broad day light, but when the place is dark, guess what…you are using your flash, others too, and really it’s annoying!!!!!!!!!!!!! Regarding the food, I had, as my main course, their fable lobster spaghetti which pasta was slightly overcooked, for my liking (a tad passed al dente and precise al dente is a must in this instance), but the lobster’s quality was as fine as it gets in town, cooked properly, meaning with proper balance between tenderness and necessary chewiness. 7/10 for that spaghetti lobster, which is indeed not the most complicated bistrot dish to cook but they did it properly, served at adequate temp, the lobster carefully sourced and this dish tasted as good as your lobster spaghetti will taste in a restaurant in Montreal. My starter were oysters, which fresh maritime quality was a reminder that JB’s strength is the sourcing of their produce (by Montreal standards, this is great sourcing). My foodie acquaintance from NYC had smoked meat nuggets (innovative, by local standards, as you’ll rarely see this food item on Montreal restaurant menus – 7/10 in both his and my assessment, tasty nuggets) and the spaghetti lobster too (above average, 6/10 according to him, although, as he confessed, his point of comparison are some coastal eateries in Italy with artisanally crafted pasta and dazzling seafood from the nearby mediterranean sea. Well, I could do that too as I have fond memories of dazzling coastal trattorias in Italy, but JB is not on the Amalfi coast, it’s located in Montreal so I’ll keep the comparisons …local!!). Seeing beautifully executed zucchini flowers at the next table, he did order them and indeed, the zucchini flowers were a world away from its tired looking examples, those tasting great and looking photo-friendly (8 over 10 – easily the highlight of that meal). Cons: Because of the serious $$ at JB, I got to the same conclusion as my foodie acquaintance from NYC ->> at such prices, I needed the best spaghetti and the best lobster to come from Joe Beef…NOT from some remote coastal trattorias in Italy, to take one example. Though, to be fair… that is not the fault of Joe. My rating for this meal: 7/10 – The ingredients are of top quality, the food is generally consistently tasty/good by our local restaurant standards. 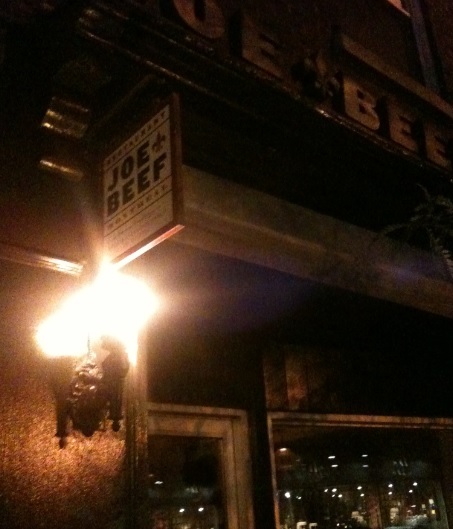 So, does Joe Beef deserve its current position among World’s top 100 restaurants in the World? As one should know better, such subjective topic as a top list is not to be taken seriously . 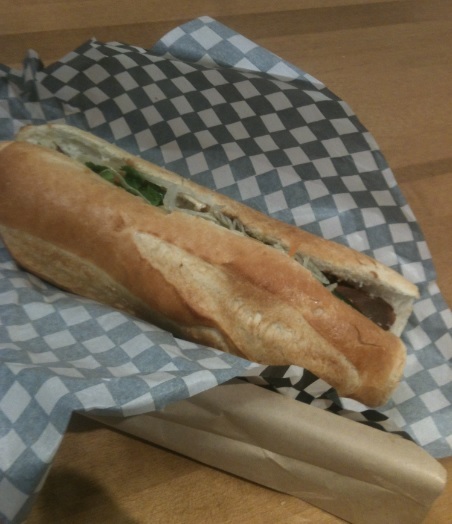 That said, listen: Joe Beef serves comfort food, crowd pleasing items. So, a piece of steak, some spinach, some tomato on one plate. Another plate can be a piece of grilled fish, some cilantro atop, a scoop of crème fraiche over here, some lentils underneath. The next day, that steak will be paired with perhaps some onion rings, and some bone marrow, the fish will be replaced by some roasted poultry served with beacon. Desserts will be items like cream puffs, poached peaches, etc. 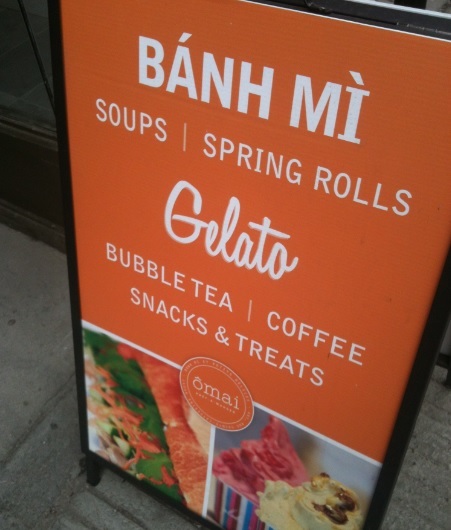 You got the picture: it’s basically some very simple bistrot fares. All done properly (JB applies the original recipes of those dishes faithfully). Now, some might say that there is no room for some simple bistrot fare among World’s best. I disagree: if your roasted chicken ranks among the finest I ever had at a bistrot, if that could also be said of your lobster pasta dish, if you did that simple straightforward / basic sauce way better than at tons of other bistrots around the world, you should be considered as a world best eatery no matter how simple your food is. But here lies my one significant quibble with JB’s being in a top 100 best restaurant list: its food is pleasant, good for Montreal, but there are bistrots abroad that pulled off far better versions of those bistrot fares, with exceptional ingredients, not just good, but exceptional, for …of course, less $$$ (but the $$$ is not a reproach to JB…Montreal restaurants, in general, are the most overpriced eateries of this globe, and there’s no secret about that!!). Bottom line: JB divides opinions. There are those who seized the opportunity to impersonate Shakespeare and write love letters about it (read: Montreal’s Joe Beef Lives Up to Absurd Expectations / by Bill Addison, Aug 18, 2014, click here for this romantic write-up ), others who do not understand its fame, there are those who were impressed by the unique charm of JB (as/per Chefs McMillan and Morin: their idea of a home where they serve food to their guests) as well as those who instantly fall for whatever Bourdain and/or restaurant Magazine recommends. I side with none of those since, in my view, JB is not the bad restaurant that its detractors are trying to portray (it’s one thing to not like that kind of food, it’s another thing to suggest that it is bad), not the exceptional eatery that its fans try hard to sell (C’mon, this is some adequate — not dazzling — comfort/bistrot food). After all, Chefs McMillan and Morin are clear about it……they are just trying to serve decent comforting food and are competing with no one!